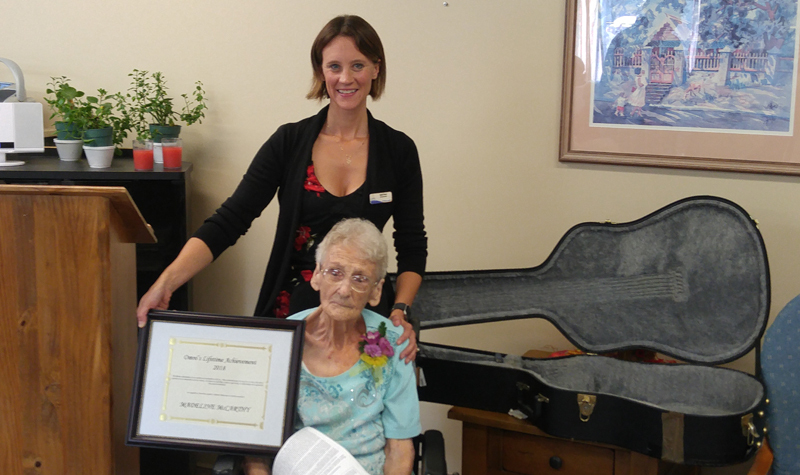 Burnbrae Gardens resident Madeline McCarthy is pictured here receiving her Lifetime Achievement Award from April Faux, the Campbellford long-term care home’s administrator. CAMPBELLFORD, Ont. – If you ever find yourself about five kilometres northwest of Havelock, Ont., you will see a road called Madeline Lane. It just so happens Madeline Lane is named after Burnbrae Gardens resident Madeline McCarthy. Madeline has been a fixture in the region for much of her 106 years, so it makes sense the community named a road in her honour in 2013, shortly before her 101st birthday. “Madeline Lane is a fitting tribute to a century of love and respect for the countryside she calls home,” Robert Pye, a local blogger, wrote on his website in 2013. The Burnbrae Gardens team presented Madeline with the Campbellford long-term care home’s 2018 Lifetime Achievement Award on Sept. 17, her 106th birthday. The award was presented to Madeline at Burnbrae Gardens during a celebration held at the Campbellford long-term care home to honour her. Madeline was born Sept. 17, 1912, and grew up in the Campbellford area. Madeline can even recall taking a horse and buggy to class while a student at Campbellford District High School, picking up classmates on the way. Upon completing high school in 1929, Madeline went to work in the office at Swift’s Meats. The Great Depression was hard on Madeline’s family. In the early 1930s the family lost their farm outside of town. But Madeline was still employed during this time and was able to get a mortgage on a new home for her family. Madeline married Joe Bolton in September 1937 and the couple raised two sons, John and Michael. In 1950, Madeline and Joe bought the Northbrook Hotel, where Madeline did the cooking. The business venture proved successful, and the couple was kept busy by serving food and providing rooms to the work crews in the area. “She is still praised locally for wonderful wedding dinners she catered to, and folks from Northbrook still tell us that when a family member would pass away she was the first to arrive at the door with a huge platter of sandwiches and home baking,” Burnbrae Gardens staff members write in nominating Madeline for the award. Joe passed away in June 1966, and Madeline married Ferg McCarthy in 1969. Madeline and Ferg shared a love of gardening and would supply the hotel with vegetables and homemade pickles. Ferg passed away in 1992, but Madeline continued to keep busy – in fact, one neighbour recalls her tarring her roof at age 85. Madeline moved to Burnbrae Gardens in December 2013 and has been popular with her fellow residents and staff members. “Madeline gets pleasure out of every day, enjoying visits from friends and relatives, and is still asserting her independence, even from her wheelchair,” staff members say.